03. Jump To Death Menu Option. 03. Will and Mark in line for medication. 04. Lori gets picked up at the police station by her dad. 05. Lori scratches the paint off of her front door. 06. Gibb yells at school & Will and Mark show up. 07. Principal asks Will and Mark to go with the police. 08. Lori, Kia and Gibb going to the rave. 09. Lori, Kia and Gibb show up at the rave. 10. Gibb sees Trey walking towards her. 11. Mark sees his brothers suicide on his computer. 12. Mark coughs up eels. 13. Everyone splits up at Westin Hills. 14. Will, Lori and Kia look at a Hypnocil patient. 15. Freddy confirms that he's possessed Freeburg. 16. Linderman apologizes to Kia. 17. Will and Lori kiss. 18. Lori says "place your bets" as Freddy and Jason start fighting. 01. 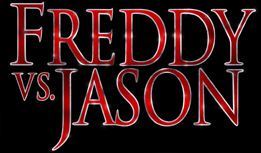 "Freddy & Jason Go To Development Hell Part 1"
02. "Slicing Towards Completion Part 2"